MyDayRegistry.com | Dedicate a Day for any Special Occasion or Event. Dedicate a Day for a Special Event or Person in Your Life. 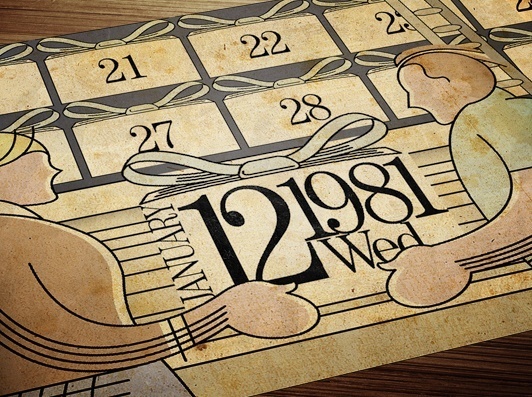 Enter the date of your occasion below. Enter the date of your event below. Every registered day is recorded in the International Day Registry to ensure only (1) owner per day. Every registered day is recorded to ensure only (1) owner per day. Every certificate is printed on a beautiful piece of high quality parchment paper and personalized in modern calligraphy to celebrate your special occasion. 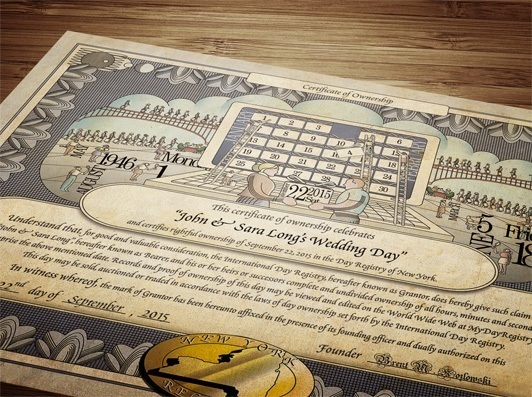 Whether it's for an Anniversary, Wedding, 100th Birthday or to drum up PR for your company the certificate can be personalized with important details to celebrate your special day. "It's truly an amazing thing you guys are doing. I dedicated our wedding day and now I want to dedicate my best friend (that has...read more"
Dedicated April, 19th 2014 as a Remembrance Gift. "My wife loved this gift for our 1 year anniversary. One of the best gifts a husband could get his wife. Thank you so much...read more"
"On our anniversary I gave my husband a day registered as our special day. He LOVED it!! My Day Registry provides the most special &...read more"
"My husband and I got married in Las Vegas and since the first wedding anniversary gift is paper I thought that buying our wedding day,...read more"
"My wife was thrilled to have a unique guest book that now hangs on our bedroom wall to remember how special that day was. We...read more"
Dedicated Feb 26, 2013 as a Wedding Gift. Create and customize a dedication page for your day. It's perfect for sharing the details of why this day is important with family and friends, while preserving those precious memories for generations to come. Personalize your dedication page with a personalized message, photos and video. Start creating your personalized dedication page while you wait for your certificate to arrive! Our Wedding Signature Keepsake is the perfect replacement for a traditional wedding guestbook. Every owner's exclusive title and ownership rights are recorded in the International Day Registry database to ensure that there is only one (1) owner per day! When someone else does a search for your day they will see that their special day has already been dedicated to you. It's one of the many reasons that make dedicating a day is a truly unique and sentimental gift for your loved one. With a limited number of days available per year be sure to dedicate your day today and experience the fun of owning your very own day. MyDayRegistry is a unique online registry that allows you to dedicate and register a specific day to recognize a special person or event in your life. When you dedicate a day to yourself or a loved one, you receive a beautiful certificate as proof of registration and ownership. You also receive an online profile that can be personalized with important details about your special day, along with music, photos, and video for family and friends to see. With three affordable packages to choose from, you can register your day by state or country, or stake your claim in the exclusive Worldwide Registry. Every owner's exclusive title and ownership rights are recorded in the official International Day Registry database—the only registry of its kind! Dedicating a meaningful day to someone makes for the perfect gift no matter what the occasion. Whether it's in celebration of your first wedding anniversary or in remembrance of a loved one, dedicating a meaningful day to someone special in your life makes for the perfect gift no matter what the occasion. MyDayRegistry is one of the most unique, thoughtful and personalized online gifts the Internet has to offer. Whether you're looking for a heartfelt anniversary gift or something special for that hard-to-buy-for person in your life, dedicating a memorable day in their name makes for the perfect gift for every occasion! Let that someone special in your life know how much they mean to you. Click on an occasion below or enter the date of their special day into the search box above.